One of the all-time great snare drums. Amazingly musical tone, no matter how it’s tuned. Modeled after the classic Slingerland Radio King drums, but with a much more modern slant, more attention to detail, and more consistent manufacturing. Manufactured by hand-operated machinery in the mountains of southwestern Massachusetts. The machine used to bend the shell of this drum survived Noble & Cooley's company fire of 1887! 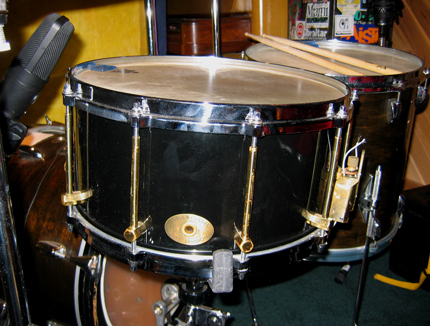 One of the most recorded snare drums of the last twenty years.